The best love awakens the soul; makes us reach for more, plants fire in our hearts and brings peace to our minds. This custom designed engagement ring is made of platinum and features one natural heart shaped diamond. The diamond is GIA Certified and weighs 1.02 carats. The color is rated E and the clarity is rated SI1. Polish and symmetry are very good. 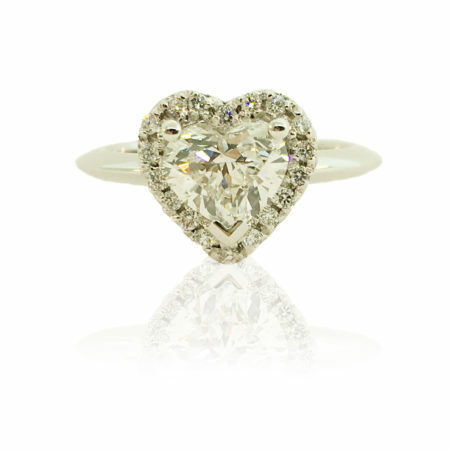 The heart shaped diamond is set with three prongs. Eighteen natural round brilliant diamonds surround the center diamond. They are prong set in a halo design. The surrounding diamonds are rated EF in color and VS in clarity. They have a combined total weight of .10cts. The shank is a knife edge design and the rings weighs 7 grams.